Charles Anderson fans have been raving about our newest designer case collection which features iconic artwork from one of the world’s most influential design firms, CSA Images. 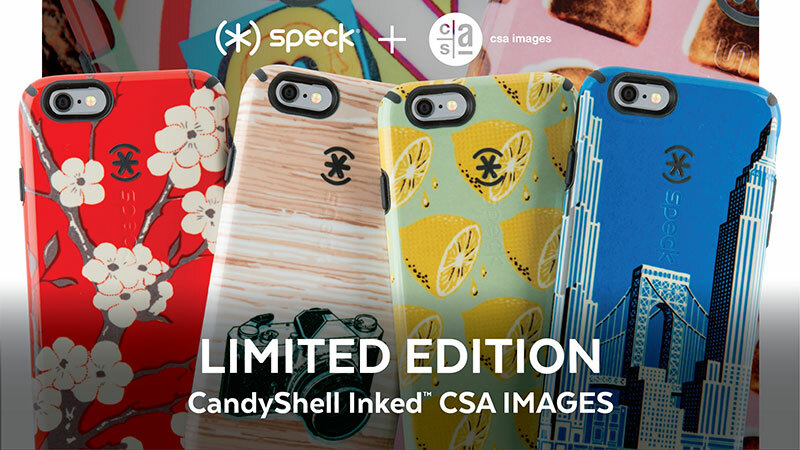 This case collaboration is the result of a life-long passion for advertising art, now available on Speck’s award-winning, military-grade protective CandyShell Inked cases. Not only are these top-notch designer iPhone 6 cases, they’re packed with Speck’s trusted 7 signs of protection too. With styles ranging from retro designs to favorite foods and beyond, you’re sure to find a case that speaks to you. Each of our CandyShell Inked CSA Images cases are available for iPhone 6s/6, iPhone 6s Plus/6 Plus, and Galaxy S6. Our action figure collection of Galaxy S6 cases feature some serious astronaut-alien conflict. Bring your Galaxy S6 case to life with these exclusive designs from Speck. Looking for a unique floral iPhone 6 case that no one can match? Our CSA Images cases are adorned with designs from Japanese blossoms to woodland life and beyond. Whether you’re crazy about crunchy toast Galaxy S6 cases or pucker up to sour lemon Galaxy S6 cases, our collection of food-inspired CSA Images cases are just the pick for you. Drooling over our iPhone 6s Plus/6 Plus canine cases? Quit slacking and buy yours today – quickly – these won’t be in stock forever! Bears, deer, or other woodland folk your niche? Make sure you get 2016’s most popular iPhone 6 animal cases – without compromising on protection. Looking to fall in love with a romantic iPhone 6s case? Look no further than our positively, lovely, retro CSA Images design. See your iPhone 6s Plus case from a new perspective with one of CSA Images’ cityscape designs. No matter the view, you’ll want to go out and put our military-grade protection to the test. You put a bird on it, you can’t go wrong. Shop our brilliantly blue bird iPhone 6 cases and iPhone 6s cases to add some song to your style. Looking for a creepier case? Our sci-fi Galaxy S6 cases put an edge on your favorite Android device while keeping you safe with slim, steadfast protection. Your iPhone 6s is brand new, so throw an old-school edge on it with our vintage iPhone cases. Don’t worry, these classics won’t go out of style. Whether frogs, kangaroos, orangutans, or camels are your thing – you and your kids will love our cartooned zoo animal iPhone 6 Plus cases. In case we haven’t scared you away yet, our creepy monster iPhone 6 cases sure might. Spook your friends with your phone’s new slim, sleek protection.